Hurricane Ophelia is now the most powerful hurricane so far east ever recorded and it is causing mini record heatwaves all over Western Africa, the UK and Ireland and Western Europe. Massive wildfires have devastated Spain and Portugal after extraordinary temperatures and heavy winds claiming at least 10 lives caused by Hurricane Ophelia. The government of the Canary Islands issued a heatwave alert for the holiday hotspots of Fuerteventura and Lanzarote. High temperatures in the range of 34 to 38 C, 100 deg F were forecast. Meanwhile, parts of the UK and Western Europe are enjoying tropical temperatures of 25 deg C, almost 80 deg F on Sunday and Monday. On Saturday, Ophelia strengthened to a Category 3 hurricane. According to Philip Klotzbach, a meteorologist at Colorado State University, this is the farthest east a major hurricane has existed in the Atlantic Ocean. Ophelia became the 10th consecutive storm to grow into a hurricane in the Atlantic this season which has now tied the record last set in the late 1800's. All schools in Northern Ireland are to close on Monday due to risks posed by gusts resulting from Hurricane Ophelia. The announcement was made by Stormont officials late on Sunday night after severe weather warnings were issued for Northern Ireland. The Met Office is forecasting winds of up to 65mph (105km/h) across the region on Monday. The Department of Education said its decision on school closures was "entirely precautionary". "However, given the weather warnings and the fact that the most severe weather is forecast for when pupils are due to be leaving school, the department believes that this is an appropriate response," it added. Ulster University announced that its four campuses will be shut for the day, while some colleges announced that they would be cancelling all classes. 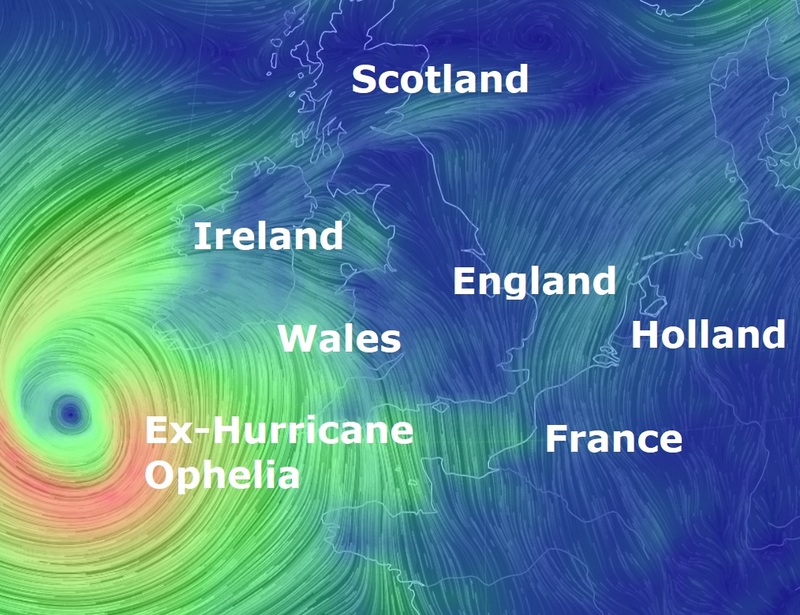 Hurricane Ophelia will be a storm when it hits Ireland and the UK as it weakens on its path across the Atlantic Ocean. But it could still cause major damage, according to weather forecasters. The Met Office said that a spell of "very windy weather" on Monday afternoon and evening has the "potential for injuries and danger to life". Issuing an amber warning - its second most severe - it said there is a good chance that some areas could suffer power cuts. All parts of Northern Ireland are expected to be hit by winds of up to 65mph (105km/h) but gusts could reach speeds of 80mph (129km/h) in the far south-east. Public transport operator Translink said its services could be disrupted by the weather on Monday - it will issue updates from 07:00. Some flights from Belfast City Airport have been cancelled due to the strong winds. All Aer Lingus departures from the airport on Monday have been grounded, and other airlines are affected. Senior civil servants in Northern Ireland met on Sunday night to discuss "a co-ordinated approach in light of the latest Met Office assessment". The Department of Education came in for criticism from parents on social media for the timing of its announcement on school closure. "However, the priority is to ensure that all children are kept safe." Schools and colleges in the Republic of Ireland are also to close on Monday after a red warning - the most severe - was issued across the country. The Irish national weather agency Met Eireann is forecasting "violent and disruptive gusts" and is warning that "all areas are at risk".